"'American Gothic' is, by a very wide margin, [Grant Wood's] most effective picture—though not his best, for which I nominate 'Dinner for Threshers' (1934), a long, low, cutaway view of a farmhouse at harvesttime that brought to disciplined perfection Wood’s strong suit, imaginative design." Thus writes Peter Schjeldahl in the current New Yorker: "Beyond 'American Gothic'" (source). For most people including me the only familiar work by Grant Wood (1895-1935) is "American Gothic" (1930). You surely know it: a portrait of two people stiffly standing in front of a gothic-style building, the man, rather elderly, holding a three-tined pitchfork and staring at the viewer, the woman with her face sort of scrunched up and her eyes on the man. In the gallery of the Art Institute of Chicago there's usually a small crowd around "American Gothic," though nothing like the crazed selfie-taking tourists that mob the Mona Lisa. Wood's painting is not only famous. It's one of the most parodied works of American art -- though not as parodied as the Mona Lisa, I suspect. Memories of the parodies probably crowd out mental images of the real art work for many people. 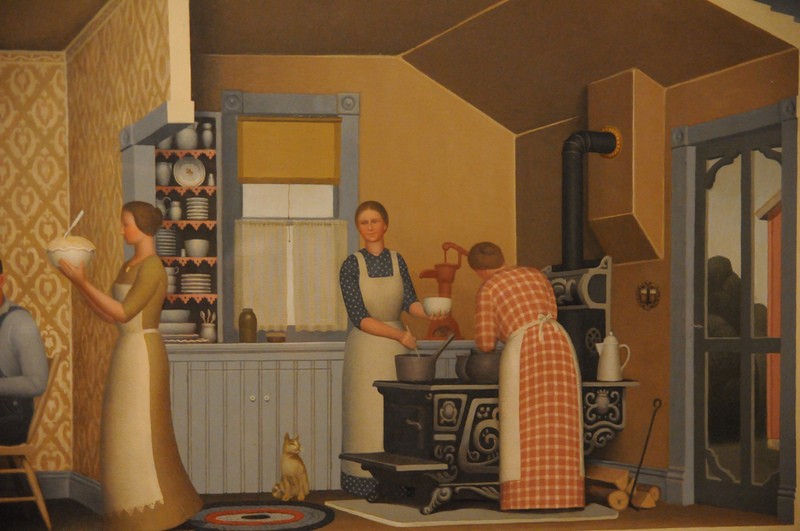 Detail of "Dinner for Threshers" -- a fascinating kitchen scene. I was entirely unfamiliar with "Dinner for Threshers." I looked it up and found it utterly fascinating. I've searched for American paintings of kitchen scenes -- there aren't vast numbers of them. Such detail! The wood stove, the cat near the rag rug, the woman holding a bowl of mashed potatoes, the red pump at the sink, the white coffee pot on the stove, the hutch full of white china... Really an image of food being prepared in a real farmhouse kitchen, I think. "In the thirties and forties, in ways that became art-world conventional wisdom, some critics equated regionalism with the blood-and-soil mystique of Nazism and/or socialist realism. But Wood, Benton, and Curry were sturdy Roosevelt liberals. (Wood headed Iowa offices of the New Deal programs that supported artists during the Depression.) Some sophisticates, in New York and Hollywood smart sets, took these artists’ works in stride as populist chic. Collectors of Wood included Cole Porter, Alexander Woollcott, Edward G. Robinson, and King Vidor. Then, as perhaps now, there was a recuperative urge among metropolitans to make nice with the disgruntled heartland—an uphill process, as witness a recent protest movement against a terrific Benton mural, at Indiana University, that features Ku Klux Klan figures, never mind that Benton meant to denigrate them." I wish I could see the Grant Wood retrospective at the Whitney Museum in New York, the inspiration for the article. Art reproductions from Wiki Art. It's lovely to know about wonderful art that has been somewhat neglected in the wide world. This painting sends me right back into my grandma's farmhouse kitchen, though I knew it a bit later in life. Thank you for sharing this story and painting. What a great homey scene. Nice to know Wood was Roosevelt liberal. I too had not seen Dinner for Threshers before you posted it. I love it! Thank you for commenting on my blog, and for your information. Thank you for introducing me to this art. I love paintings, illustrations, everything, which have many aspects, to search for and find. "Then, as perhaps now, there was a recuperative urge among metropolitans to make nice with the disgruntled heartland"
-chuckle- Nope, not now. Now, Intellectual metropolitans prefer to call the disgruntled heartland, by the term "Deplorables." "a recent protest movement against a terrific Benton mural"
And all of this, is just simplistic thinking, which helps the general Liberal Cause. -sigh- People need not agree with, what happened in History. But no one has the Right, to try to obliterate History. "Could not detect a feed for this URL. Blog posts and update time will not be shown." Could you possibly look into this? Maybe do a Search... Concerning this topic... There are probably instructions, for how to make your blog comply with the Blogger Follow gadget.